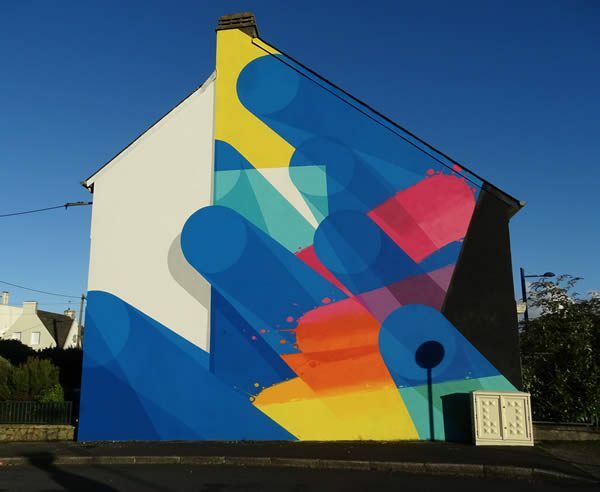 Beginning his experimentation with graffiti at the tender age of 15, self-taught artist Franck Noto—aka Zest—has honed his singular style over the years that have followed; now one of France’s most celebrated street artists. 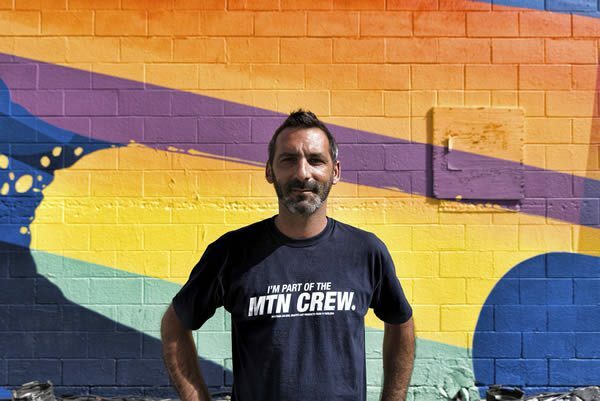 The Montpellier-born painter started out, as many other graffiti writers do, with markers, rollers, spray-paint cans, and brushes. 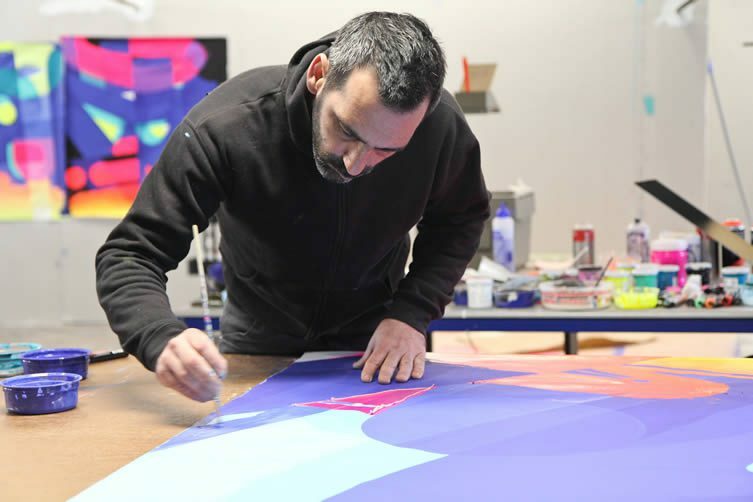 Although the tools of Noto’s trade haven’t changed much over the years, his work has moved away from figurative to epic abstract frescoes that can be found in both the streets (frequently on a monumental scale) and galleries of cities across the globe. 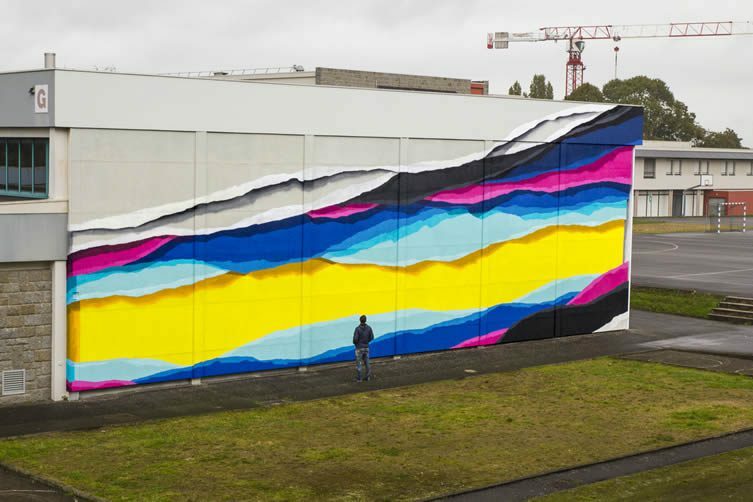 Now, more than ever, colour is intrinsic to his spectacular work; landscapes depicting experimental forms of sculptural sharp lines and irregular colour blocks weave among curves and waves. 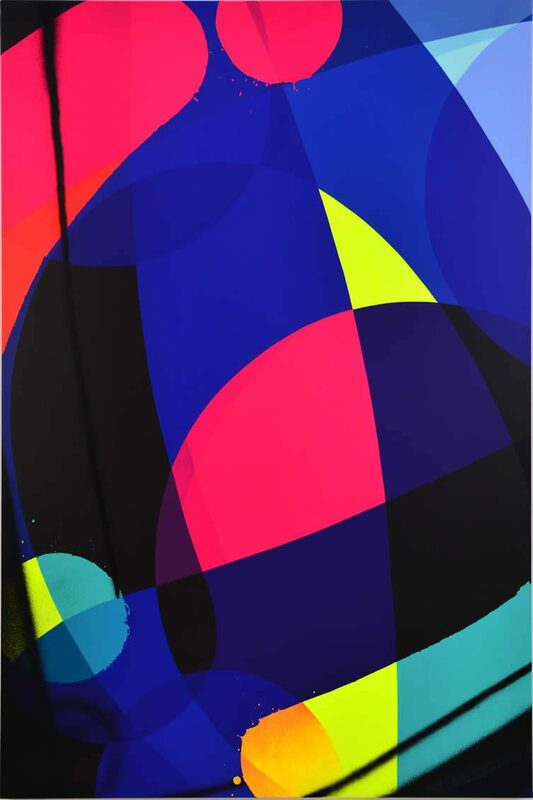 In a way, through years of painting walls in primary colour variants, Zest has adopted an almost poetic geometry. Acclaimed designers such as Philippe Starck and Agnès b admire his aesthetic and energy, and he’s never too busy to collaborate in order to expand his experiences and aesthetic. 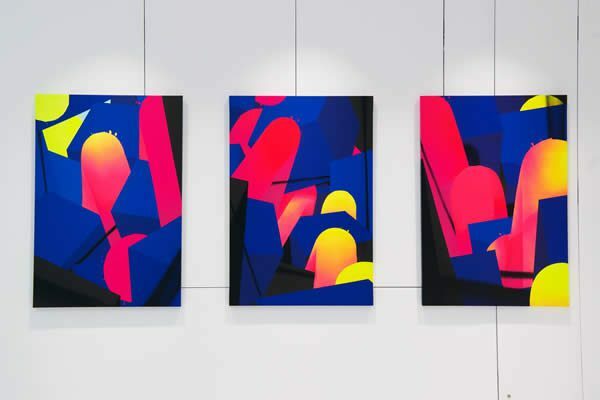 Colour-pop and experimental tones are one of the many reasons why street art aficionados admire Zest so much—wanting to find out more about his imposing and mesmerising work, by getting to know the man behind the attention-grabbing colour landscapes, We Heart interrupted his latest solo show at Zürich’s Kolly Gallery for a quick chat. Tell us about your studio; where is it and can you describe it to us? 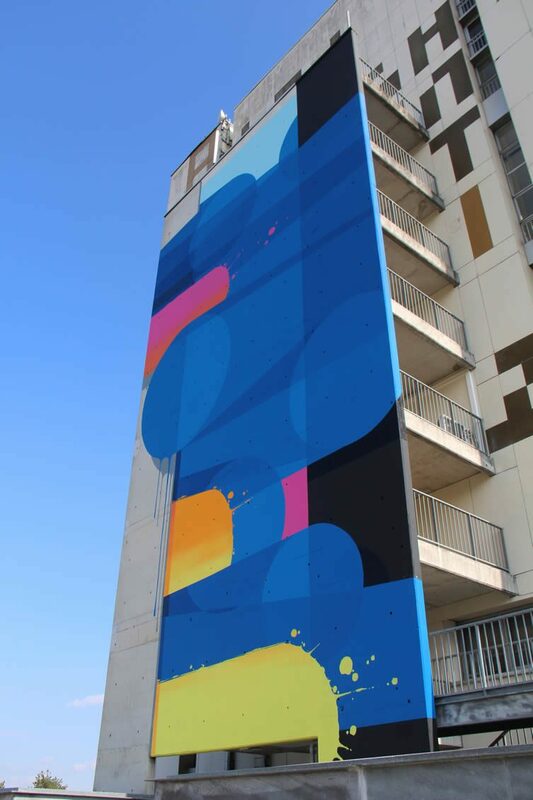 My studio is located in Montpellier, France. I’ve been working out of this space for a little over a year. It was once a local jazz spot known as the Saxophone—I can still remember seeing numerous people outside the doors that came for the different concerts, and the residual energy left from the art of music that once played here. The part that I work in is vast, and filled with lots of natural light. 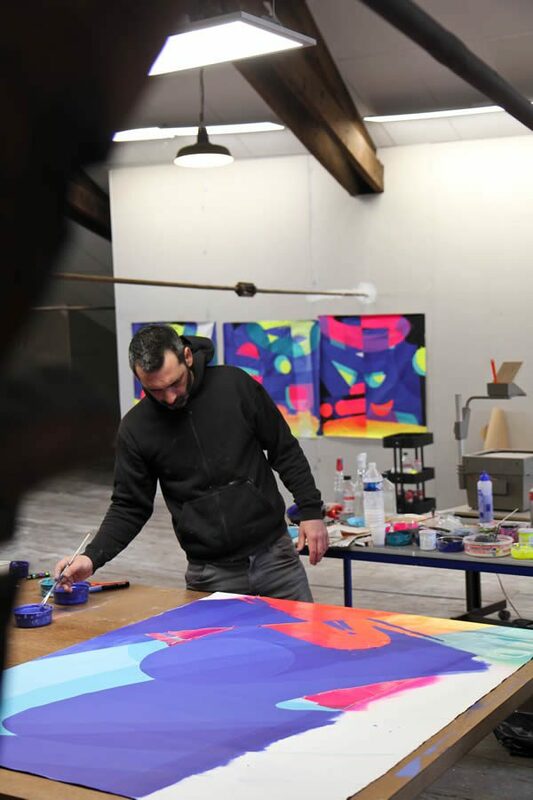 Seven other artists have their workshops in the same building, and the combinations of energy already instilled in the location allows us all to dive deeper into ourselves; to go past our previous artistic limits. How do you visualise your work? Do you sketch, or use a computer? I create rough sketches as guidelines for what comes to me regarding the direction, and then I switch to canvas. I don’t use a computer because it limits me with any improvisational paths I might decide on in the moment. 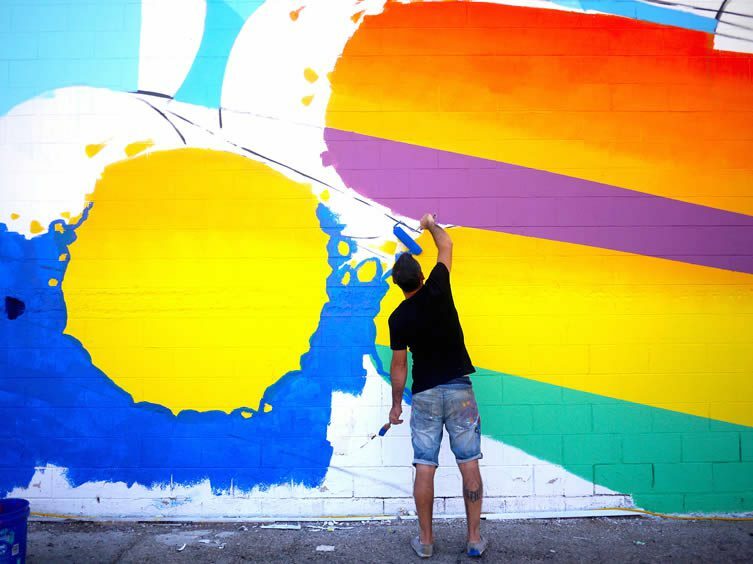 Growing up, graffiti, tagging, and spray-cans were a part of your repertoire; how have you fine-tuned your more abstract style? I feel I represent everything that I saw during my years in the world of graffiti. I try to combine all the different energies found in that discipline, and have them manifest themselves through basic forms and primary colours. 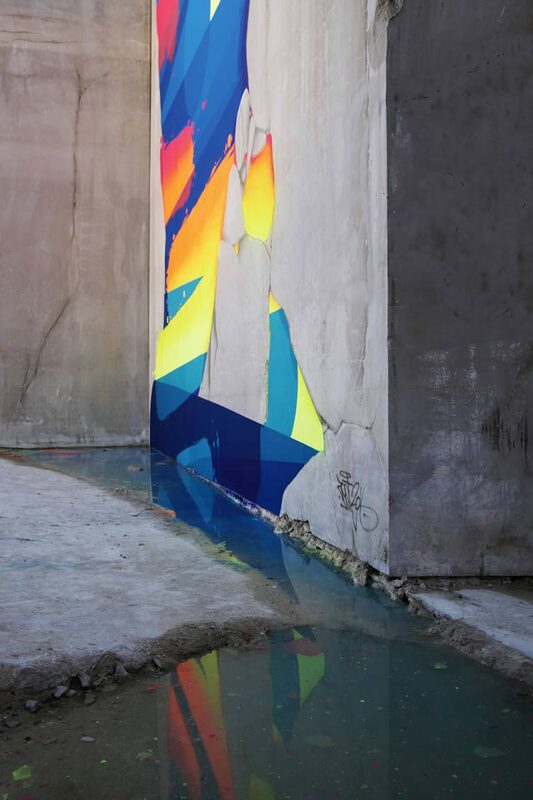 My choice of vibrant colours symbolises the part of graffiti that quickly seizes the spectators’ attention. The transparency of the forms represents an accumulation of this movement. The ‘fat cap’ (a cap used to make wide lines) is represented with blues and the ‘baranne’ (a shoe polish container previously used as a graffiti tool) with the fluorescent colours. 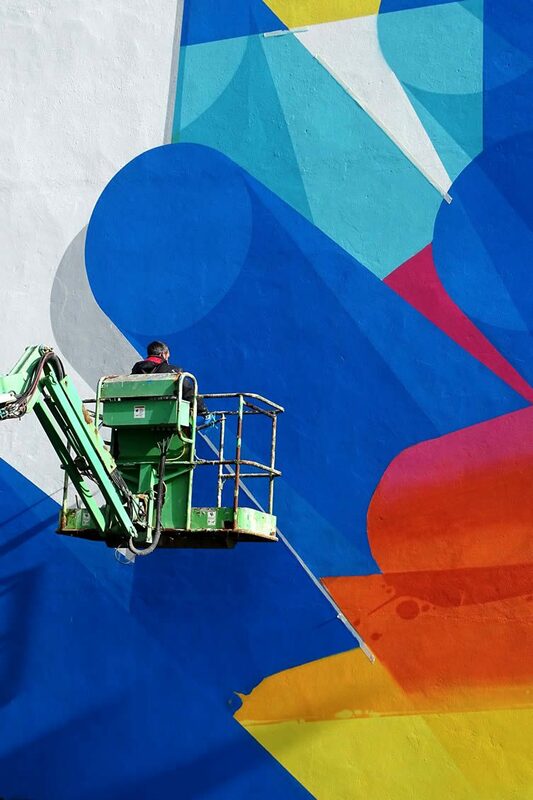 Your work can be found all over the world, can you tell us where we can see some? My work can be found not only in galleries but also as various murals. For me, I like the balance between having work that’s indoors, but also outside, which is accessible to all those who pass it. I have pieces in galleries in France and the U.S.A., and I’ve painted murals in Argentina, Spain, France, Germany, and Nouméa. 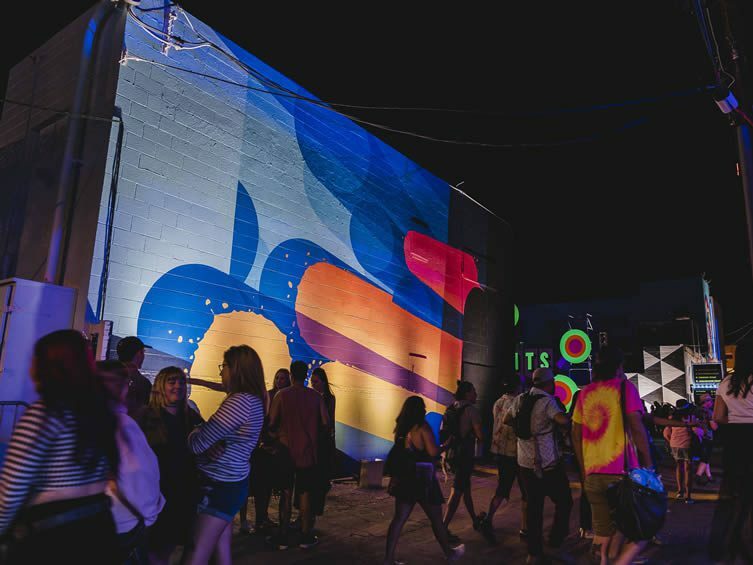 JustKids x Life Is Beautiful Festival 2017; the streets of Downtown Las Vegas transformed into an open-air gallery featuring the best of contemporary visual culture. 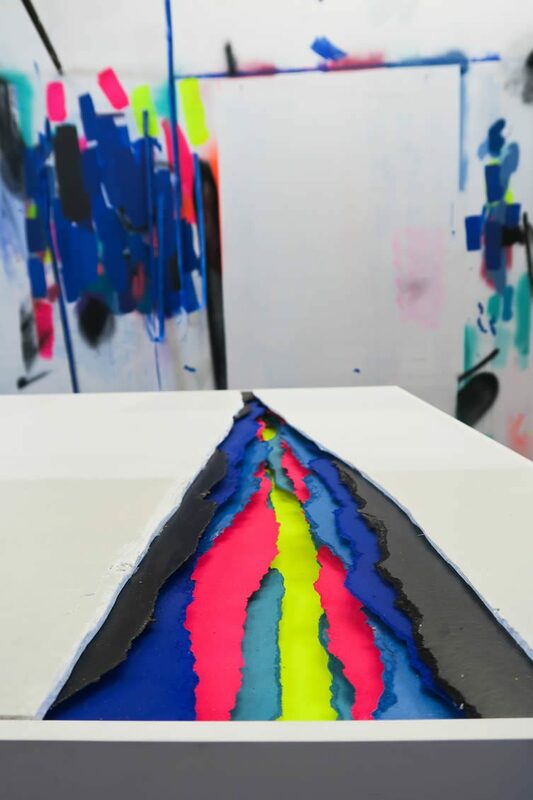 Your latest work has taken a step away from figurative art to a more abstract form, is this natural progression or an intentional one? It’s a natural progression. As I evolved as a person and in my art, my figures naturally took on more abstract forms. 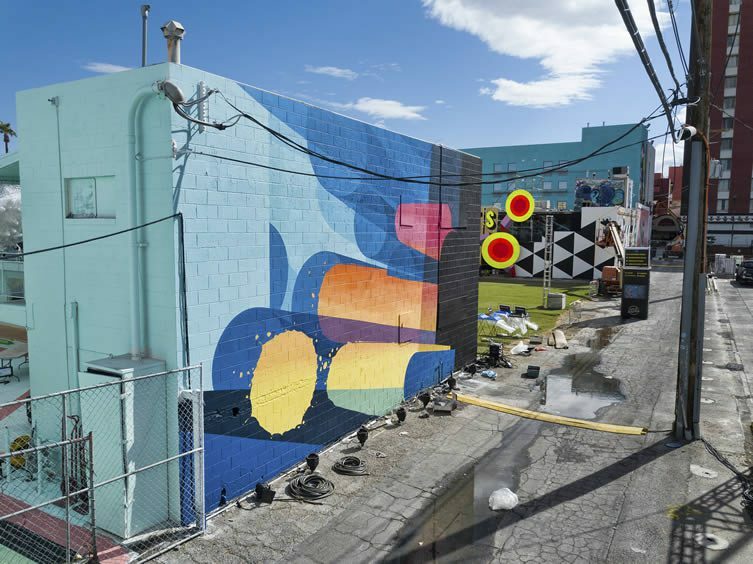 You have worked with Widewalls on numerous projects, can you tell us about the importance of organisations/galleries such as this for street artists? 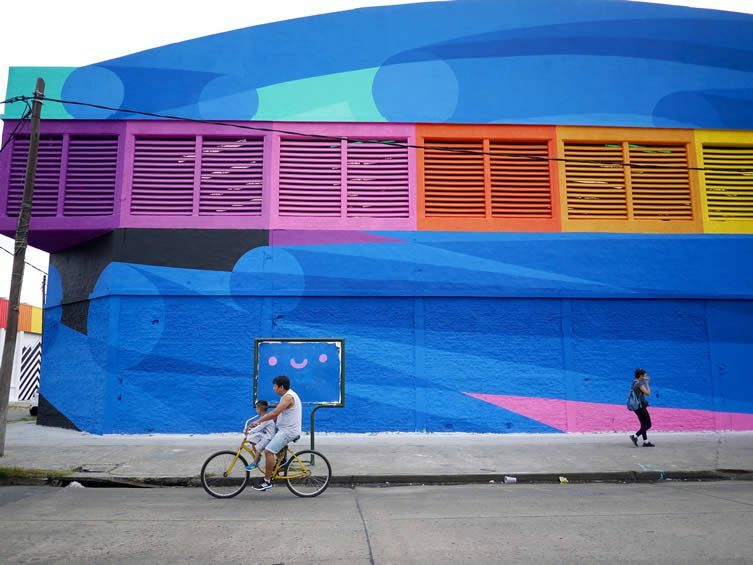 Widewalls create the possibility of transporting our artwork to those who might not be close to where we’re located. 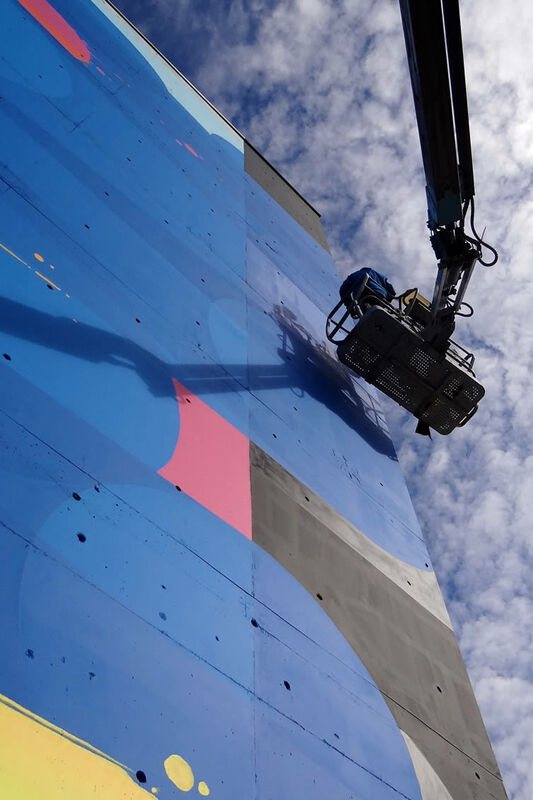 It also creates a professional image and acknowledgements for the work that urban artists create; allowing for street art and graffiti to find its place in the wider world of art. You have collaborated with the likes of Philippe Starck and Agnès b; can you tell about these projects? Philippe Starck and Agnès b. reached out to me, and I found a link between their proposal and my work. I’m always looking to evolve and to participate in projects with people like Starck and Anges because it creates an opportunity to grow. They have a lot to share, and I’m always open to exposing myself to experiences that might be different than my own; stepping out of the ‘known’ to expand my horizons. We’ve heard that you experiment with gradients and chiaroscuros, how do you do this? I’ve always been attracted to the primary colours that I use. They are the source of all the other colours and can be dynamic in their own right. Little by little I experimented with different combinations and incorporated gradients and chiaroscuros. 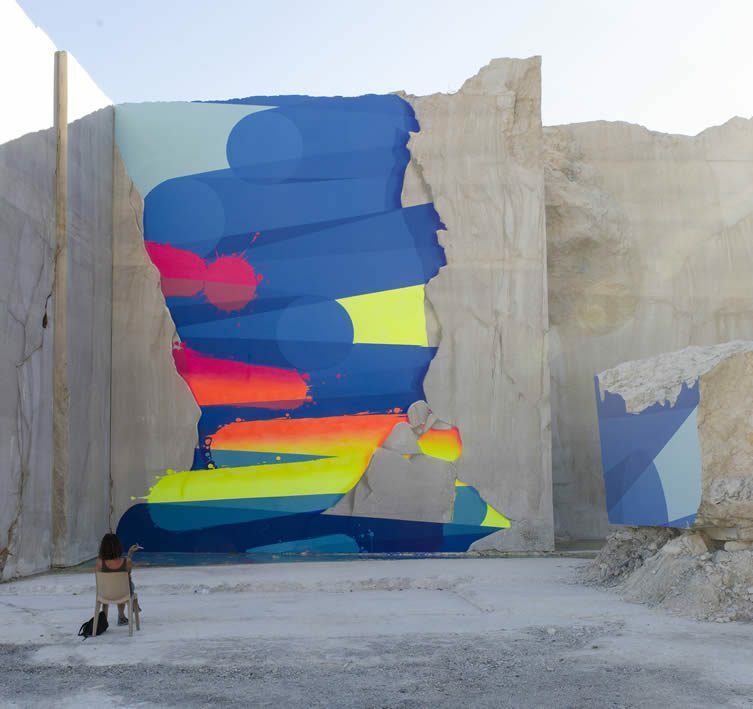 In the world of graffiti, transitioning from different colours plays a role in the composition of a piece, transferring this technique to canvas came naturally. Tell us about your solo exhibition in Zürich. My current solo show—Ral 5002 at Kolly Gallery—runs until 31 March. The title of the exhibition is based on the name of a principal colour I use in my work. 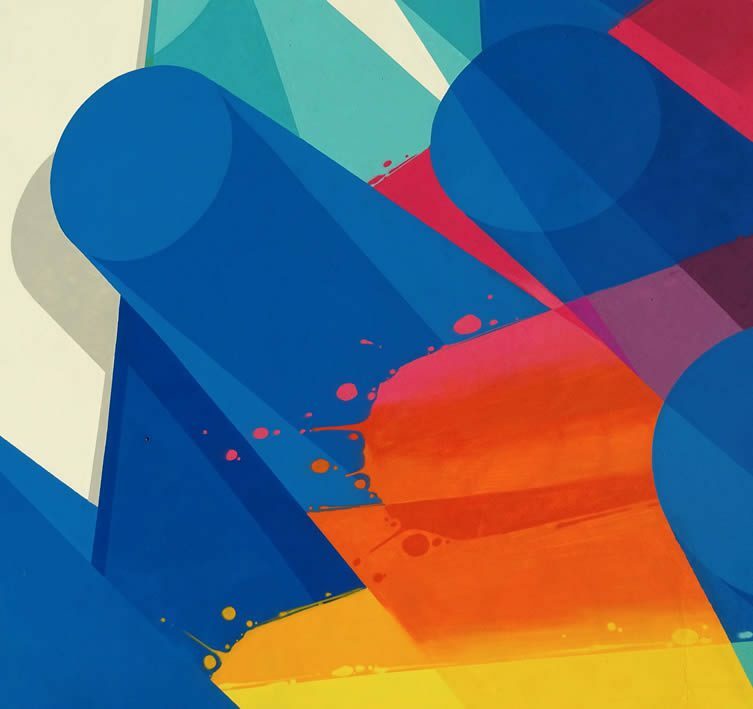 The Ral is a universal colour in the world of painting that was developed in a German laboratory, and bridges the universal access to this type of art. Contrary to lots of artists that try to possess a colour of their own, for me, the path had a clear choice to work with a colour that’s accessible to all. The concept is to go from a canvas that represents my years of graffiti arriving at a point where a clean white cover is created, but where the passionate energies behind the world of graffiti find a way of seeping up through the almost invisible cracks to find a way back to the surface of this cyclical pattern.